Cumbrian born Matthew Wilson is undoubtedly an up and coming star in the world of rallying. Achieved his best WRC result, 4th on Rally Japan and scored points on three other events; Mexico, Ireland and GB. Best ever finish in WRC Drivers’ Championship in 11th place with 11 points. Youngest ever driver to win a WRC stage and claim a drivers’ point, achieved on Rally Argentina 2006 and classified as a finisher on all 16 WRC events. 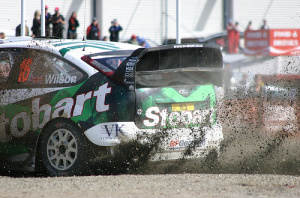 Contested 16 WRC events for the Stobart VK M-Sport Ford Rally Team in 2006. Competed in Rally GB in 2005 (15th) and 2004 (13th). Joined the MSA British Rally Elite training scheme for young British drivers in 2005. Winner of Rally Ireland in 2005. Youngest ever winner of a British Rally Championship round in 2005. First WRC event was Rally GB in 2004. His first rally was in 2003, co-driving his father Malcolm Wilson to overall victory. Matthew Wilson has only been a rally driver for three years; his first event was in 2003 when he acted as co-driver for his father, Malcolm Wilson. A year later he was behind the wheel himself. In 2004 Wilson was the only driver to achieve a 100% reliability record contesting the MSA British Rally Championship, finishing third overall and scoring points in every round. His best result was third overall on Trackrod Rally Yorkshire. That year he made his debut on Wales Rally GB, finishing 13 th overall. Rallying is somewhat in Wilson’s blood. His father, Malcolm, oversees the M-Sport organisation which runs the BP Ford works effort in the World Rally Championship as well as the Stobart VK M-Sport Ford Rally Team. Malcolm Wilson competed in 45 WRC events between 1977 and 1995. He also has a rally named after him, the Malcolm Wilson Rally, which is in its 30 th year in 2006. Malcolm made his debut on the RAC Rally in 1977, finishing twelfth overall at the age of 21. 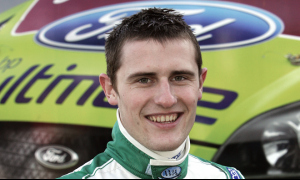 Matthew’s career was given a boost in 2005 when he was selected to be a part of the MSA British Rally Elite scheme, a national training initiative supported by the MSA, UK Motorsport’s governing body. A total of six of the top young drivers and co-drivers in the UK were chosen to participate. They receive training in areas including Sport Psychology, Sport Physiology, Media Skills and specific driver and co-driver training. This year was a somewhat difficult season for Wilson with his MSA British Rally Championship programme curtailed after an accident on the opening round, the Rally of Wales in April. Despite this, he had already won the Malcolm Wilson Rally in March and once back to full health he took victory on the McRae Stages Rally and was winner on Trackrod Rally Yorkshire, becoming Britain’s youngest-ever winner of a British Rally Championship round – at 18 years, 8 months and 5 days. He also took victory on the inaugural Rally Ireland in mid-October. Wales Rally GB that year saw Wilson take 15 th overall. In 2006 however, his career moved forward massively as he contested a full programme of sixteen FIA World Rally Championship events as lead driver in the Stobart VK M-Sport Ford Manufacturer 2 Team. Co-driven by Ulsterman Michael Orr, the pair put in a stirring performance and were classified as finishers on every single round of the championship. Wilson entered the history books on Rally Argentina, becoming the youngest ever driver to take a WRC stage win and score a driver’s point in the championship. 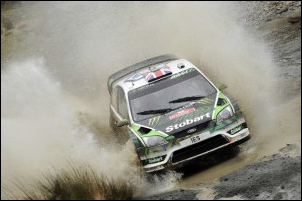 2007 saw another full season as part of the Stobart VK M-Sport Ford Rally Team, again partnered by Michael Orr, and again using the championship-winning Ford Focus RS WRC06. For the first time in his career, Wilson had the advantage of returning to more than one event with a set of pacenotes already in hand. This undoubtedly made life easier as he pushed for more impressive results in his second full season. At the midway point of the 2007 season Wilson had been progressing steadily. 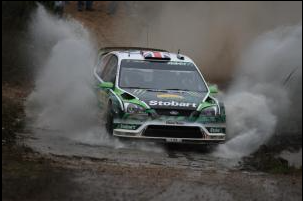 To open his account he was the top-placed Stobart VK M-Sport Ford Team driver in Rallye Monte Carlo, finishing 12 th. Rally Sweden was not so kind to the 20-year-old, it was his first ever DNF in a WRC event after the breather pipe on his Focus RS froze up bringing his rally to a halt. Corona Rally Mexico proved successful for Wilson, putting in a sterling drive to finish the event eighth and claim his first drivers’ point for 2007. The next four events saw steady performances from the youngster finishing three of them inside the top 12 including the BP Ultimate Acropolis Rally of Greece where he finished a well earned tenth overall. The second half of 2007 proved a far better show as the youngster put the pedal to the metal to showcase his true potential by scoring drivers’ points over the final three events of the year. Rally Japan was first off and Wilson finished in an amazing fourth place, his highest ever placing in a world championship round. Then in Ireland, an event he won in 2005 when it was run as a candidate event, the youngster scooped up two drivers’ points by finishing in seventh. It was perhaps the final event however that really showed his improvement over the year. Against a host of world rally cars the Cumbrian lad finished his ‘home’ event sixth ahead of some well established drivers as he took the result on pure speed and not on the back of other competitors misfortunes. This resulted saw him finish the championship in 11 th and will certainly be a confident platform leading into the 2008 championship. The now 21-year-old Wilson has had a super start to the year and is currently ninth in the Drivers’ Championship after eight rounds. The youngster has already posted more points in the first half of 2008 than his entire 2007 season and has equalled the total amount of points scored in his career to the end of 2007. The highlights for Wilson so far this season have been his fifth place finish on his first outing to the Middle East on the Jordan Rally, and his sixth place finish in Mexico where he was nominated to score manufacturer points for the Stobart side. If not for a faulty throttle spring in Sweden the Brit could have another four points to add to his tally but as it stands he is still in fine contention to finish the year as one of the top-ten best WRC drivers in the world.